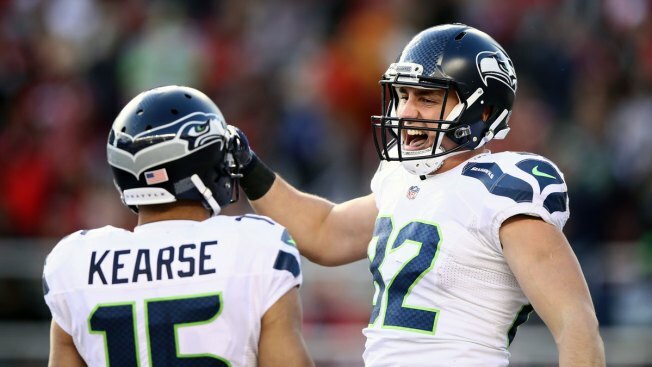 Luke Willson #82 of the Seattle Seahawks celebrates with Jermaine Kearse #15 after Willson caught a touchdown pass at Levi's Stadium in Santa Clara, California, Jan. 1, 2017. After a bumpy start to the season, Russell Wilson is improving as the Seahawks begin the playoffs at home against the reeling Detroit Lions on Saturday night. Gametime is set for 7:30 p.m. ET Saturday, and NBC Sports will be streaming the game live online here. The Lions, who lost their final three games to finish 9-7, mostly feasted on bad teams and benefited from some good fortune on comebacks this season. But Matthew Stafford is coming off a fine season in which he’s had to carry most of the load — the Lions’ run game has been very quiet this season. 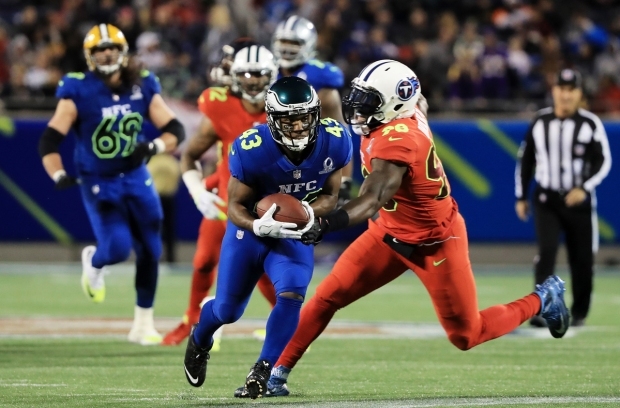 Seattle’s excellent run defense should be able to make this game one-dimensional and force the game into the hands of Stafford, former Seahawks receiver Golden Tate and tight end Eric Ebron among others. The Seahawks — who are 7-1 at home this season — are well positioned to take advantage of the soft spots in Detroit’s defense. Wilson should enjoy going up against a pass defense that allows opponents to complete more than 70 percent of passes. He also has found the Seahawks’ matchup-straining tight ends of Jimmy Graham and Luke Wilson often this year. Wilson injured his ankle in Week 1 and knee in Week 3, but never missed a game this season. He had a wacky five-interception game against Green Bay in December, but responded by closing the season with eight TD passes against one interception in the last three games. On defense, the Seahawks will be without star Earl Thomas but Kam Chancellor has stepped in to lead the defense. Up front, Cliff Avril and Frank Clark have combined for more than 20 sacks and should be able to get some pressure against the Lions’ average pass protection. Detroit RB Zach Zenner totaled more than 100 yards rushing and receiving and has emerged as the Lions’ best option at the position. Detroit CB Nevin Lawson has shined while the Lions defense has struggled. The Seahawks’ easiest yards through the air will probably not come against his man. Seattle TE Luke Wilson is the second option among Seattle’s tight ends, but has two TD catches in the last three weeks. Seattle S Steven Terrell has performed capably in the absence of Thomas, and allowed only one catch on Sunday.